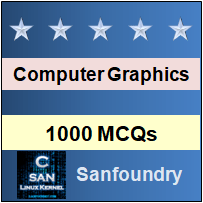 This set of Computer Graphics Multiple Choice Questions & Answers (MCQs) focuses on “Area Sampling”. 1. We can think a line as a _____________________ in the grid. Explanation: A line can be viewed as a rectangle of defined thickness. It covers a desired area in the grid. Even the thinnest horizontal line has a thickness of one pixel. 2. Line should set an intensity of only a single pixel in a column to black. Explanation: A line should not set an intensity of a single pixel in a column to black, but rather should contribute some amount of intensity to each pixel in the column, whose area it intersects. Explanation: The signal can also be represented as a frequency domain, that is why we may represent it as a sum of two different sine waves. 4. What is lower bound on the sampling rate known as? Explanation: Sampling theory tells us that a signal can be reconstructed by its samples. The original signal is sampled at a frequency larger than twice. This sampling rate is called Nyquist rate. Explanation: The equal area contributes to equal intensity in area sampling. Only the total amount of overlapped area matters, regardless of the distance between the pixel’s centre. 6. Which of the following is NOT a type of area sampling? Explanation: Weighted and unweighted area sampling are types of area sampling classified on the basis of proportionality of intensity. Anti-aliasing is another name of unweighted area sampling whereas, point sampling is not a type of area sampling. 7. The technique of setting the intensity proportional to the amount of area covered is used in weighted area sampling. Explanation: The technique of setting the intensity proportional to the amount of area covered is used in unweighted area sampling. This technique produces noticeably better results than others. 8. What happens to intensity if an area of overlapping increases? Explanation: When the line covers pixel completely the intensity is a maximum while when the line doesn’t touch the pixel the intensity is zero. Hence we can say, the intensity is directly proportional to the overlapping area. 9. What is the effect of weighted area sampling on adjacent pixels? Explanation: The net effect of weighted area sampling is to decrease the contrast of adjacent pixels. This gives a lot of help in order to provide smooth transactions. 10. What is the name of the effect that causes different signals to become indistinguishable? Explanation: When the resolution is too low, visual stair-stepping of edges occurs in an image. That effect is called aliasing.